Armed with a mission to transform how entrepreneurs market their business, Alex established Linkfluencer which aims at training entrepreneurs to leverage LinkedIn & improve their business opportunities. Alex’s entrepreneur spirit was ignited by a fund raising project he managed when he was a kid. The whole process of sourcing for giveaway items to sell to other kids & strategies to raise more funds served as a powerful kick-start to his entrepreneur career. 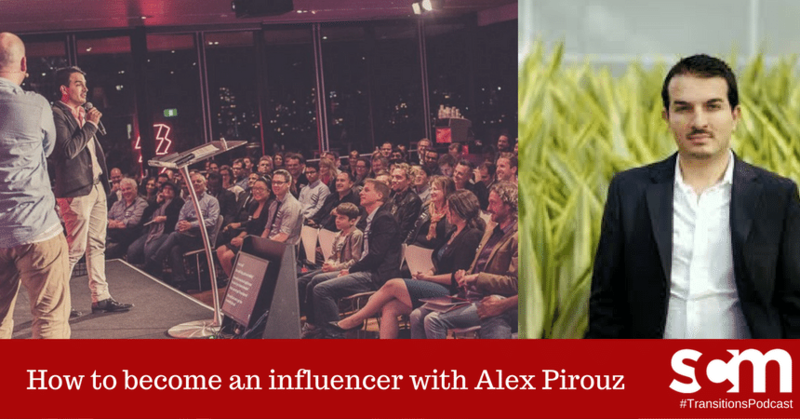 In this episode, Alex shared his journey as well as practical tips on how you can leverage LinkedIn to become an influencer. www.linkfluencer.com – connect with Alex and grab his free 3 Steps to Linkedin Mastery video & guide. The Influencers Podcast – Tune in to Alex’s new show where he interviews influencers from the business and professional worlds. SCM podcast service – Want to launch a new podcast or put your existing show on autopilot? Check out our done-for-you podcast service. Momentum Warriors – Join our private Facebook Community of 240+ creatives, entrepreneurs and changemakers to support & motivate each other to take action! Thank you for listening! If you enjoyed this episode, please feel free to share it using the social media buttons on this page. I’d also be VERY grateful if you could rate, review, and subscribe to Transitions Podcast on iTunes. Or, if you use Stitcher, you can leave a review right here. That all helps a lot in ranking this show which means more people get to listen and learn from it, and that would be super appreciated. And if you have any comments or questions, leave a comment below!